Jeden ersten Mittwoch im Monat treffen wir uns in der Raststätte in der Lothringer Straße in Aachen zur Synthesizer jam SYNC. Weitere Details zum Programm der Raststätte mit Konzerten Lesungen Ausstellungen und mehr findet ihr hier. Im Video ein kurzer Mitschnitt aus dem vergangenen Jahr. snippets of sound by Sequencomat. For the first year I kept a price of 180,- Euro, and I still think is worth it. But time changes…. Lemur is discontinued and I got a new job – so less future development. Love to all my users who just got the free update to V3.3. - till V3.2 the notes followed a static chromatic scale. Now you can define your scale on the maxpatch. You enter a keynote and the halftone steps based on that. There are shortcuts for chromatic, major and minor scale, but you can enter any halftone row you prefer! Even halftone steps above 12 (across one octave) will work. - The grid on the Lemurs MultiSliders will follow the number of notes/octaves you have defined. The script is triggered by the trackchoice button, so rechoice once before you get any changes. - till V3.2 transposing of notes and octaves was done on the Lemur, graphic based. - in combination with “autopatternchain” you can live edit up to 160steps long patterns! - unfortunately, sets of V3.2 and 3.3 are not compatible – paste V3.3 into a new folder! - still combineable with MU or other nice tools on your Lemur. Finally, V3.3 puts it to a max. 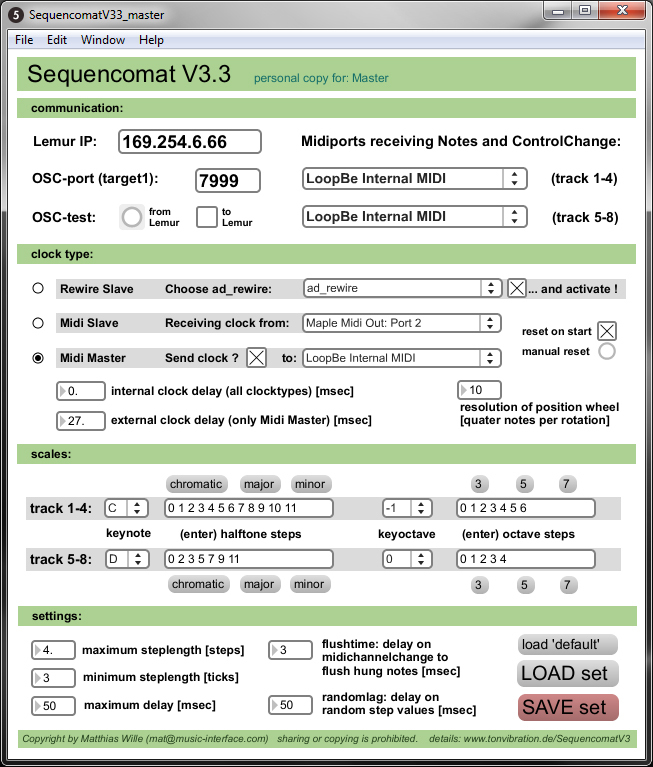 It brings the idea of V3.2 with random step switches to all functions, adds free defineable scales and octaves and some other usefull stuff. At the moment I am not planning to do any further updates. Sequencomat got mentioned on the famous “create digital music” blog (CDM) – the cheerleader in electronic music. I had an email discussion with Peter Kirn about Sequencers, especially on the Ipad, and their restrictions in communication and function. I mentioned that sequencomat will have them all for dinner And Peter posted most of the parts of my email and also linked my videos. In the comments you will see, that I got also some kind of trolls which do not believe in stability and time accuracy of my Sequencomat. Well, I can not confince him…but as he owns no Lemur at all it is useless anyway However: I garanty good timing and that timing of the (free) demo version and the (paid) full version ist the same. Just test! Unfortunately, Jazzmutant close its gate…. Due to JMs offical press release, they will sell no further Lemurs by the end of this year. Lemurs (pronounced /ˈliːmər/ us dict: lē′·mər) are a clade of strepsirrhine primates endemic to the island of Madagascar. They are named after the lemures (ghosts or spirits) of Roman mythology due to the ghostly vocalizations, reflective eyes, and the nocturnal habits of some species. Although lemurs often are confused with ancestral primates, the anthropoid primates (monkeys, apes, and humans) did not evolve from them; instead, lemurs merely share morphological and behavioral traits with basal primates.